The Department of State provides Michigan State ID which serves as a legal identification card for children. It is a good idea to have a state id for all your children in case anything happens that you have a legal document and picture to show the police. The enhanced Michigan state ID for children card is a federally approved document that allows your child to re-enter the U.S. when traveling by land or sea from Canada, Mexico, Bermuda, and the Caribbean without the need to show extra identity or passports at the border. This is optional because, federal law doesn’t require an enhanced ID, passport or passport card for children at border crossings until they are age 16. The standard or enhanced Michigan state ID is available for any child or infant at the parent or guardian’s request. Provide proof of the child’s valid Social Security number. Social Security information will be verified. Sign the application on behalf of an infant or child who is unable to do so. Have the child’s photograph taken. Pay the standard state ID card fee if not exempt. Residents under age 21 will have “Under 21” printed above their photo. The child must have a valid (for example, the child’s Social Security card). Social Security information will be verified. Residency (a current Michigan photo ID card) You can confirm residency through documents in the parent’s name if you establish the family relationship by other forms of proof. Please refer to the Documents Required for an Enhanced License or ID form for a complete list of acceptable documentation. Parents or legal guardians must sign the application on behalf of an infant or child. 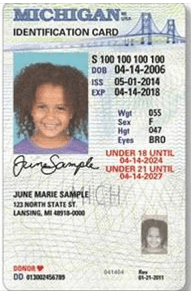 Enhanced Michigan state ID cards issued to applicants under age 21 will have “Under 21”, below their photo. For enhanced Michigan State ID all documentation is subject to Department of State approval. A second visit may be necessary if you don’t get same day document approval. Your child’s enhanced Michigan state ID card will be valid for up to four years. Finally, click the link to view our article on other services that Michigan Secretary of State Express Services provides online services.